From dates to weddings to job interviews, women want to look their best when attending an event. In our Future of Retail Experiences study, we learned that 77% of millennial women purchase apparel and accessories for an upcoming event. These findings made us curious, and so as part of the POPSUGAR Insights study "Beauty Evolved: How Millennial Women Shop for Beauty and Personal Care," we wanted to get an understanding of whether a similar percentage of millennial women purchase beauty and personal care products in advance of upcoming events. The simple answer is yes, event invitations do spur women to shop for beauty products! Overall, 72% of millennial women said that they are motivated to purchase new beauty and personal care products "very often" or "often" in advance of a specific event, and that over one in four (26%) buy beauty products very often. In fact, millennial women are 13% more likely than women between the ages of 35 to 49 to buy beauty products for an upcoming event. 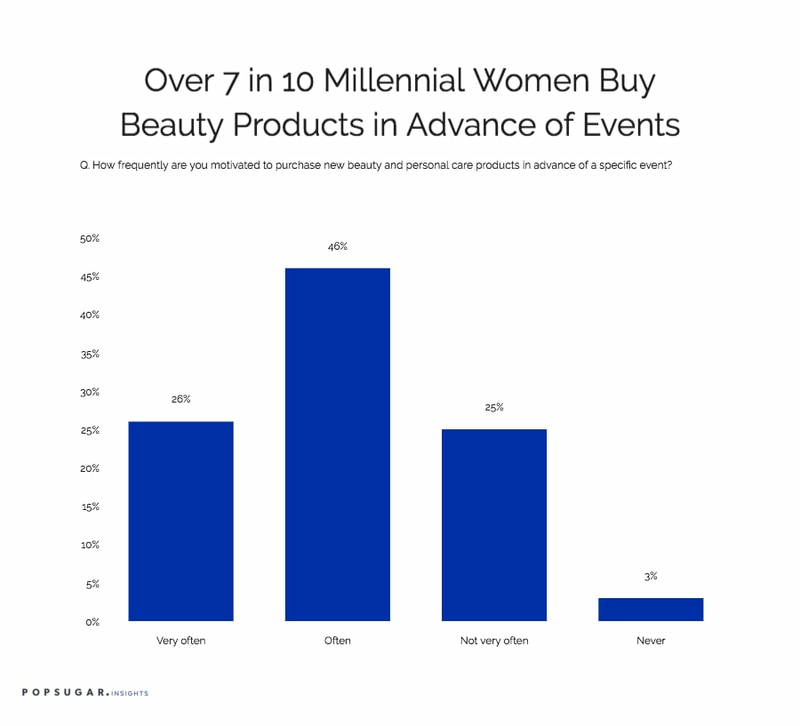 The specific events that drive millennial women to purchase beauty products vary. Millennial women are influenced by the holidays (52%), a specific date or anniversary (47%), a significant party or birthday (45%), an upcoming vacation (39%), a wedding that they are attending (38%), or a job interview (33%). Millennial women are 73% more likely to purchase beauty products in advance of a job interview, 36% more likely to purchase in advance of a wedding they are attending, 34% more likely to buy in advance of a date or anniversary, and 27% more likely to purchase in advance of the holidays than women between the ages of 35 to 49. Brands looking to reach millennial female audiences can tap into these insights to create content and messaging that speaks to these specific events and use behavioral targeting to reach these audiences.